There was a lot of excitement, anticipation and hope in the minds of 38 CTCians who set off to conquer the mysterious peaks of Ombattu Gudde on Friday Oct 31st. 32 of us boarded the Lalbaugh Express and 6 more joined us from Bangalore that night. After noisy games of UNO, snoozing and snacking on the train we set off to OG from Bangalore in the SRS travels bus. All hopes of a sound sleep were ruined by the fearless driver and his ultimate supersonic brakes! Nevertheless nothing could dampen our spirits. We stopped at a roadside dhaba for a sumptuous(well some could call it that) meal of Rotis, Chana, Dal, Paneer and Rice, much needed before the arduous adventure we were about to embark upon. Another 5-6 hours of not-so-sound sleep later we reached a small teashop close to the destination, where people stocked up on anti-leech supplies and very soon we were all out of the bus, distributing food, fruits and water. Even at the beginning of the trek, one would be amazed by the beauty around! It was just a trailer of what we were about to see. We started off with a simple walk of a few kilometers which was spiced with fun conversations, during which we really got to know each other. And if that wasn’t enough the leeches were also persistent on befriending us, we had a lot of “aaah, eeew, leech!” cries, but we managed to stay on track nevertheless, nearing the jungle at a steady pace. We were greeted of course, by a beautiful water stream, which was just ideal for our pre-trek swim/massage. We had breakfast after a nice dip in the refreshing cool water and all of us were energized for the task ahead. This was of course preceded by elaborate and varied anti leech remedies being put to practice. There was Nilgiri oil, tiger balm, volini, deospray, lemon, snuff, mixture of stuff being applied on the feet, stuffed in the socks! Various unique combinations of pants/sock/shoe styles also came forth. Hats off to Arul, Claudy, Remi and all the other navigators who were deciding the path ahead using the map, we were just following them in the dense jungle that lay ahead. Anand kept marking the path on the trees/rocks. Diwakar and Amal were ensuring that all the trekkers are going at a steady pace, sending the slow ones like me to the front every now and then. Vivek and Karthick sweeping us deeper ahead. There were huge elephant footprints/pugmarks(?) here and there, everyone was on red alert to catch some wild life in action. But we fled when we heard noises of bamboos being split and broken followed by loud trumpets of elephants. No one knew if that was one elephant or a herd, but we didn’t want to risk it! We kept going, in the dense vegetation, slowly on the edge of streams, trying to avoid getting our shoes in the water, and taking the rocks and fallen tree branches whenever possible but then eventually we were walking only in the streams! 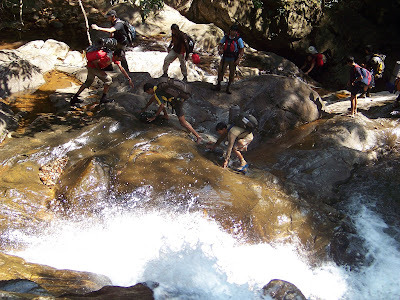 Arul kept telling us that we need to stick to the stream at all times, that was our trail. So we kept wading in the ankle or sometime knee deep water, Oh the water, crystal clear, ice cold.. there couldn’t be anything better than that! All along we had scenic forest beauty around us, wild mushrooms, vipers, a treat for the eyes! After hours and hours of this, we finally stopped at a nice spot for a lunch of thepla, chappatis and pich-koo! Next was where the real trek started, uphill all the way, the boulders kept getting bigger and bigger and the thorny bushes all the way. There were tricky green branches lying around which we kept grabbing for support only to find that they are all broken. We crossed huge broken trees. There was no path to follow, we were just trickling ahead like water, each person taking the path which they found the easiest. This is where the real team work came to play, the guys ahead warning us about the thorns, or slippery rocks, everyone giving each other a hand. Heavy bags were being passed ahead to reduce the effort of skirting tricky rocks by the waterfall. There were massive boulders to cross, where shoes came off. Everyone was either in their hawai chappals or walking barefoot. I found it so easy climbing it up barefoot, amazingly God just designed our feet to be so much more flexible than 3k shoes! We even spotted a tortoise there, who was photographed like Queen Victoria being the rare wildlife that we spotted. The tortoise too enjoyed the attention I guess, because it did not go back in its shell even once, during all the flashlights of cameras! Alas, eventually we had to bid farewell to the tortoise, and continue on our way. After 2-3 hours of strenuous trekking, we reached the last water source, where we all filled up our water bottles. By then we had scaled atleast 500 m I guess, and the Sun God was slowily dissapearing. We were still in the forest though. Arul and Co, went ahead to figure out the trail, while we all sat behind marvelling the beauty around us. We knew we were at the edge of the forest, for we could see the promised grasslands between the tall trees! Within minutes Arul was back, and the decision was taken to go to the RIGHT. 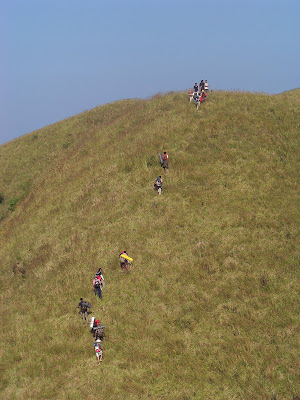 This RIGHT is very important, because in Arul’s words “our trek got 20-30% easier, compared to OG-1, because of the decision to go RIGHT.” After this right we just kept going steep uphill towards the grasslands. The sun set at around 6 pm, and soon the torches were out, and the climb kept getting tougher and exhausting. “Come on, you can do it”, “Don’t stop, you will get more tired if you stop”, “Keep going, we have to get out of the jungle before it gets dark” these were the common lines used to shepherd the tired crowd. Very soon we left the forest trees behind, and were walking in tall grass, which was tricky, because we had no idea what we were stepping on. There was gravel, pebbles, sand, rocks, boulders concealed in the tall grass, making it even more challenging to complete the last steep bit, with torches in hand. With tremendous effort, people carrying each others bags, we finally made it to the base camp at around 7.30 pm, which was heaven after a whole day of arduous trekking! Everyone was busy trying to settle down for the night, finding a neat spot to lay the mat, drying clothes, shoes, fighting for snacks that were appearing out of nowhere. There were murukku, halwa, energy bars, dry fruits, dates and even olives! The cooks started collecting firewood for boiling water for delicious cup noodles, which were the most yummiest most deliciousest thing for starved trekkers like us! After a nice dinner, there was a UNO session which went on till 11 pm! But there were others like me who hit the sack at 9, and slept blissfully under the clear starry night sky. Never have I felt more in touch with nature. After a good nights sleep, only interrupted by the chilly cold breeze or the occasional noisy snoring trekkers, we were woken up by Vinod at 5 am sharp! Surprisingly everyone woke up without too much delay, I guess the promise of watching the sunrise washed away all longings of sleep! By 6 am we were all set and raring to go. Aah the beautiful grasslands, which we couldn’t appreciate in the darkness of the night, looked so appealing at the break of dawn! We still had to scale a few hundred meters to touch OG-2, but the sight before energized us like nothing else could! It took about another hour of steep, grassy uphill climb to finally reach OG-2. It was tiring, but there was an upside to it, if you got tired, and stopped for a bit, you could look around at the mighty peaks, beautiful valleys, the sun slowly rising and the sun rays sprinkling beauty on everything they touch… grass, rocks, pebbles, people ! Cameras were going click click. It was an unforgettable experience. And we had so much more in store! Most of all was the immense satisfaction of finally making it on top of OG. Looking at the faded old CTC T-shirt, proudly resting on top of OG. A great moment for the entire team, those present and those absent as well! We left Pramod’s tattered old denim, as the OG-2 mark.. maybe the OG-3 team can put the OG-1 T-shirt and OG-2 pant on a scarecrow :). We had a huge breakfast of butter jam sandwitches, theplas, fruits, chappathis, pretty much everything that everyone had left to eat! After stuffing our faces, we started with the photosession, pics to prove that we made it all the way! There was one pic where we went a bit downhill on the other side, so the photographers could click it from the top. Some of us did not want to go there and come back up, in order to conserve what little energy we seemed to have remaining. But we still went ahead and did it, mob mentality or whatever you want to call it. Looking at the pics now, I think it was worth every bit of effort. After this all we wanted to know was, how far the jeep trail is. Somehow after we reached the peak, we all seemed to just wanna get out! Arul and Diwakar kept showing us how far it is, and I kept thinking how much more climbing is in store for us. Nevertheless, the team spirit came into play again and we climbed two more peaks, with the sun beating down on us, and limited water to drink. It was a relief when we finally reached the jeep trail. There we met a gentleman who told us the way to get to some estate from the jeep trail where we can find water as well as reach Hosakere. After thanking him we started walking on the jeep trail. But I was a fool to think that the hard part is finally over. Because the challenge of the jeep trail may not be steep rocks, and tall grass, but the fact that its just a long never ending road, which has no trees, no shelter, exposing us to the elements! It was about 10.20 am on Sunday, when we started walking on the jeep trail, and the sun was only going to get hotter and hotter. But I soon realized that heres where the friendship and camaderie that was developed in the past two days, really came to play. Even though we were all tired and thirsty, the friendly comments, stupid conversations, kept us going, and we did not even realize when we reached the point where we had to get off the trail, into the estate! 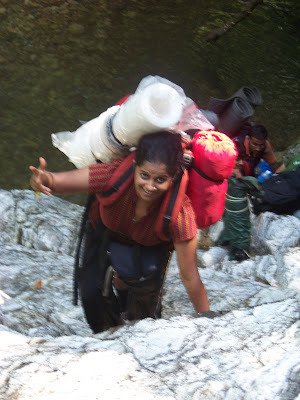 We were so happy to be there, that we forgot about Diwakar and Karthick, who had no idea we left the jeep trail! They kept walking ahead! The estate was a nice walk, acres and acres of grass, beautiful trees, tiny streams flowing here and there, to quench our thirst. Everywhere we looked was a treat for the eyes! At long last we found a nice big stream of water, for all of us to take our post-trek dip in. Even though it was not the best of the streams that we had encountered, everyone was ecstatic to take a dip in the refreshing water. The last of all the food was polished off at this point. At long last, after we all felt that we were good to get out of the water, we saw Diwakar and Karthick walking in from afar. And thats when we found out that they had reached the end of the jeeptrail, which was an alternate exit point. But being the perfect organizer that he is, Diwakar realized that he had all the return tickets, and in view of the greater good, he walked all the way back, into the estate, and reached us in time! After all our blunders came to light, and after everyone had their fill of water fun, we went another half km ahead, to find our musical brake bus waiting for us. After a change of clothes and tidying up, we started for Bangalore from Hosakere at around 1 pm. We saw a couple of movies in the bus. A fast forward version of Lagaan, and a mysterious 20 min version of Rang De Basanti! But ravenously hungry that we all were, we had to stop at Bellur at around 2 pm for lunch. After a nice vegetarian meal, energized, we got into the bus again, this time not as trekkers, but crazy singers! One would think that after all the hard work of trekking we would all be snoozing in the bus right. But no, we started our suong suession in full gusto, and there were carnatic suongs, sung melodiusly by Indira. There were modified Hindi, Tamil, Malayalam suongs sung with full dance action! Remi joined in with French numbers! It was crazy crazy fun, that just cannot be described in words! No one knew where the time flew by and we reached Bangalore at around 9 pm. After long goodbyes to all our Bangalore buddies, and with more than two hours to spare, we all had a sumptuous meal again, at Hyderabadi House, close to the Bangalore Majestic. We boarded Chennai Express at 12 am, Monday from Bangalore, and were back to Chennai at 7.30 am Monday morning. A wonderful trek, perfectly organized, extremely well executed! There were no unexpected surprises, and everything went according to the plan. Dying to go back to OG! All the sincere trekkers respect nature and try to keep it clean and avoid littering anything. They take the sweet memories of the trek with them in the form of photos etc. But we were amazed by the fact that Chennai trekking club(CTC) members are keeping old cloths as mark of the trek on the peak and encouraging OG-3 and others to some more. By all respect I would suggest CTC organizers to refrain from such activities in future in the interest of nature and the beauty of the peak. This type of attitude and trend which is being set is not a healthy sign at all. Imagine what will happen if all the trekkers start keeping their cloth or something else on the peak they visit. e.g. KP (Kumaraparvatha) receives hundreds of trekkers every week. In fact there is a campaign in media to prevent our national heritage from this kind of attitude. We have visited OG from all possible directions. During our last visit, we spotted those cloths left by CTC during OG-2 on the peak. Now those no longer exist there. I humbly request CTC to discontinue this kind of trend.